Creating collaborative partnerships has always been at the core of what we do at Good360. In fact, our unique model of connecting for-profit donors with vetted and qualified nonprofit organizations hinges on our ability to collaborate across the private and public sectors. By bringing together corporate donors who want a streamlined process for product philanthropy with nonprofits who rely on donations to run their operations better, we create a win-win proposition for everyone. Most importantly, it means we can amplify the impact of all parties involved, helping to transform more lives in the process. One such fruitful collaboration resulted in the donation of more than $300,000 in toys last week to thousands of families throughout Puerto Rico. 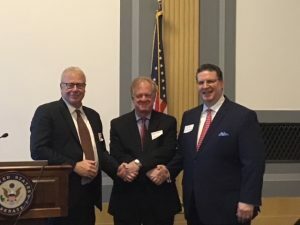 This major donation event could not have happened without the coordination of key Good360 partners: the UPS Foundation, the Safe America Foundation, Mattel, and the American Specialty Toy Retail Association (ASTRA). A personal request from Puerto Rico’s First Lady, Beatriz Rosselló, set the donation in motion. She was looking for a way to distribute dolls, board games, baseballs, and other toys in areas still struggling from the devastation of Hurricane Maria in 2017. 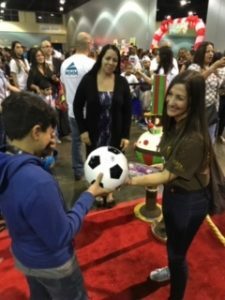 Her request culminated in the arrival of 15,000 toys from Good360 alone on the island during “3 Kings Day” (also known as Epiphany), one of the most important holidays in Puerto Rico. Traditionally, most of the Latin world marks the eve of January 6 as the day to exchange gifts, concluding the 12 days of Christmas. 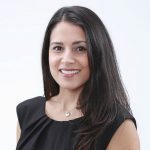 Rosselló had originally reached out to Safe America, a Georgia-based nonprofit that focuses on public safety campaigns such as drivers’ education and emergency preparedness. She had gotten to know Safe America president and chief executive Len Pagano after he arranged for the delivery of solar-powered stoves to Puerto Rico. A critical component of the partnership came through with the assistance of the UPS Foundation. The philanthropic arm of the delivery giant has been one of Good360’s most important partners in disaster recovery, and has enabled us to get goods to logistically challenging locales such as storm-ravaged Puerto Rico. After Hurricane Maria devastated the country’s already fragile infrastructure, getting critically needed supplies to remote parts of the mountainous island became a matter of life and death, quite literally. Fortunately, the UPS Foundation stepped up to deploy its logistics capabilities to aid in the humanitarian effort. In the immediate aftermath of Maria, UPS flew nearly 30 flights, delivered more than 60 ocean containers, and sent more than 5,000 pallets to Puerto Rico and the island of island of Vieques to deliver vaccines, health kits, and packaged meals for FEMA, UNICEF, and other agencies. In all, UPS has transported more than 100 in-kind shipments to assist recovery efforts in Puerto Rico since the hurricane. For our part, UPS allowed Good360 to get shipments of solar-powered generators, personal care items, and other goods onto and across the island. 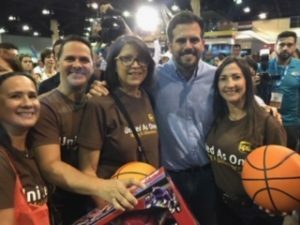 For this most recent donation effort, UPS not only shipped the toys to Puerto Rico, but UPS volunteers also were on hand to distribute the products around the island. Of course, there would have been no toys to distribute without the help of generous corporate donors such as Mattel and ASTRA. Mattel is a long-standing Good360 partner. ASTRA, a trade group which represents independent toy makers, collected thousands of donated toys from its members. ASTRA was also launched the Toys for Joy program in collaboration with Good360 to support the 2018 holiday season in the wake of Toys ‘R’ Us shutting down. Led by Puerto Rico Governor Ricardo Rosselló and the first lady, the donation event distributed toys in eight cities and was even broadcast live on national TV across the island, Pagano said.